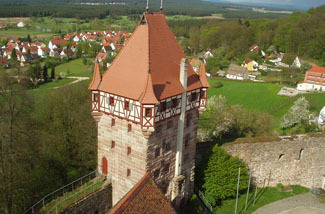 Abenberg had its origins in the 11th century when Count Adalbert II built a wooden castle on the site. A hundred years later a stone castle replaced it and this new structure became the seat of the powerful counts of Abenberg. The Abenbergs soon died out and the Hohenzollerns of Nuremberg inherited the castle. Even though they rarely stayed there, they doubled its size and added some defensive structures. The ring wall is now the oldest surviving feature of the castle. In the early 19th century, the Kingdom of Bavaria acquired the property and slated it for destruction, but the castle won a reprieve in 1875 when a Munich art dealer bought it and began rebuilding. His work was continued by chamber singer Anton Schott, who rebuilt the Schottenturm (the main tower where many of the guest rooms are). The castle fell into disrepair during the 20th century. Finally in 1984, the town of Abenberg took over the castle and along with the District of Central Franconia, they set out to preserve the integrity of the historic structure and carry out archaeological excavations on the site. The hotel and restaurant help provide funds to continue this work. Atmosphere is everything! Even though the rooms in the guest house are very nice, since you’re staying in a castle hotel, you want to stay in the castle and not in a building down the hill. Take note though, the tower (where the rooms are in the castle) does not have an elevator. Restaurant is closed on Mondays. Abenberg is 25 km southwest of Nuremberg. You can’t miss the grand tower of this delightful castle hotel as you drive into town. In fact, your perfect room will be in this tower. Guest rooms are located in two very different places: the tower and a guest house which is below the castle, reachable via a small footpath. Furnishings are in keeping with the castle’s history but with a modern touch. All rooms are spotlessly clean and feature flat screen TVs and free wi-fi. Instead of a double bed, you may find two beds pushed together. Bathrooms have showers. From the tower rooms, you can look out across vast views of the countryside. A cozy, vaulted-ceiling dining room serves up delicious international and regional cuisine. A substantial breakfast will keep you going all day. Your castle hosts, the Schneiders, are a lovely couple who oversee the comfort of their guests. They have brought a lot of fresh ideas to Abenberg with special packages including Harley-Davidson or Segway trips, and themed mystery or fairy tale dinners. Musical events are scheduled throughout the year. The Franconian History Museum and a lace-making museum are located on the castle property.